The Master level beekeeper should be able to function as a sideline or commercial beekeeper, if he or she desires, and have some expertise in several sub-specialties of apiculture. In accordance with the NC State Beekeepers Association, this level encompasses the certified and journeyman levels, plus additional requirements. Review the WQ Master Web Quiz about frequently missed questions. 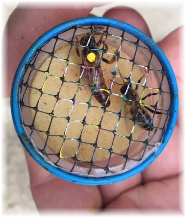 Learning about bees can be quite fun and one of the goals of Haywood County Beekeepers Charter is to help the public become comfortable around bees. Though they can be agitated at times, in general bees are quite easy to handle. Just avoid disturbing their hive too much. Thus, our beekeepers will host booths at various events through the community for the purpose of exposing others to these pollinating insects who offer so much to our environment. The next time you visit a festival and there is a bee display, visit the booth, you will not bee… disappointed. The Certified level is the entry level of the program for participants with basic knowledge of honey bees and bee management. Prepare yourself for each certification tests. Review the Certified Web Quizzes about “frequently missed questions. 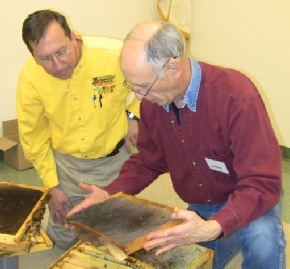 The North Carolina Journeyman level is comprised of beekeepers with demonstrated competence in the craft of beekeeping. Each successive level requires that certain minimum criteria be met, which are summarized below. Prepare yourself for each certification tests. Review the Journeyman Web Quiz about frequently missed questions. Find a Mentor in our chapter. Join our local beekeepers chapter- HCBC membership form. Beekeeping in Tennessee - an excellent guide for beginning and experienced beekeepers. Bill and Tom checking out a bee frame. The North Carolina Master Beekeeper Program (MBP) is the largest program of its kind in the country. Established in the fall of 1982, its purpose is to provide an infrastructure whereby beekeepers can improve their beekeeping skills and knowledge on a continuous basis within a system that objectively and formally acknowledges those accomplishments. It also serves as a means of providing valuable information to beekeepers and the public through various outreach services. The MBP consists of four ascending levels of beekeeping expertise. Each successive level requires that certain minimum criteria be met, which are summarized in the following areas: Tests, Service and Experience, Level, Written, Practical, Oral, Beekeeping Experience, Public Service, and Other. Visit the North Carolina State Beekeepers Association (NCSBA) for more information on Bee Schools. Can you spot the “drone” bee? 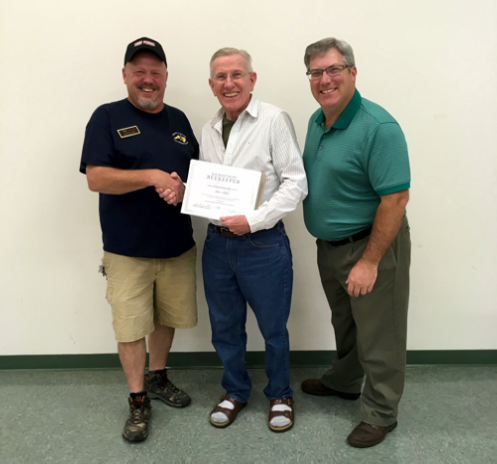 Beekeeper Jim Coller receives his certification for the “Journeyman” level in beekeeping. Presenting the certificate are Regional Director David Massengill and HCBC President Allen Blanton.